When it comes to a dining table and chairs, I love to mix and match. I find it's often more chic--and certainly more interesting--than doing a perfect set. That being said, not every chair will look good with every table, and not every grouping will work in every home. There are a few guidelines to work with here. Let me walk you through them. One option: you take this concept as far as it can go, and have chairs that match neither the table nor each other. This works best in a casual space, where mixing and matching is par for the course. This room above looks coherent because the entire space is insouciant. 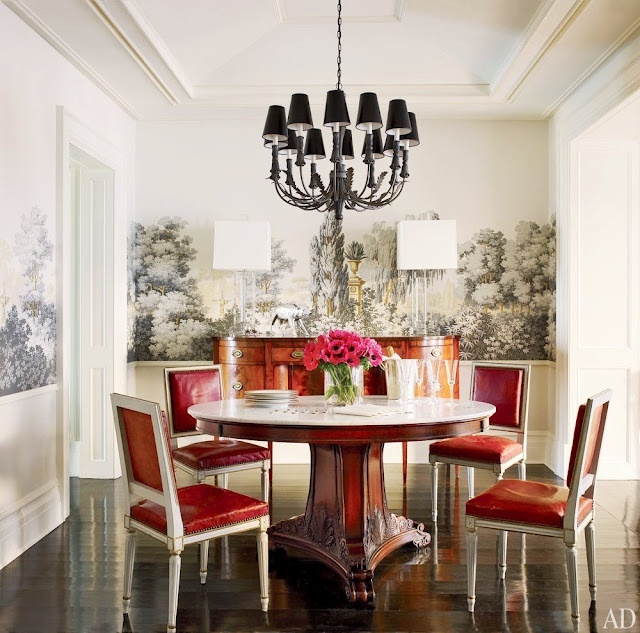 From the gallery wall, with its combination of contemporary and traditional art, to the feminine antique chandelier, to the industrial table and assorted old and new chairs: it's all a grand mix. In other words, because nothing matches, it all does. Assuming you want a look that's a little more formal, I'd suggest a matching set of dining chairs paired with a different style of table. There are a few ways to work this. You can take a matching set, but alter the finish on one part of it. This dining table and chairs used to be finished in a glossy cherry stain. My clients didn't want to get rid of it, but they were willing to try an easy, inexpensive update by painting the chairs white. This change breathed new life into the whole room, and made the set feel much more contemporary, too. Another option: pair like with like in terms of general style, but not material or finish. Traditional with traditional, for example. Pairing like with like works well because you keep style coherent, so the pieces are of the same voice. Yet it is also visually interesting because nothing matches precisely. Finally, you can mix and match in terms of finish and style: old with new, for example. This is slightly trickier to accomplish than mixing like with like, as you need to create some through line with your pairing. In the three examples above, that through line is palette. These lucite Ghost chairs are made of a new material, but their classic shape relates well to the antique table. These chairs and table share a utilitarian nature. Though they're made out of different materials, both the aluminum chairs and farmhouse table feel indestructible, and perfect for a family home. Here's another great pairing with modern chairs and a farmhouse table. The chair legs, though brass, have the same honeyed tones as the wood of the table, which helps them cohere. In fact, a farmhouse table is one of the easiest styles of table to pair with modern chairs, as they share a certain frankness of line. As you can see, there's lots of ways to go about mixing and matching your dining set. Why not give it a go? It'll freshen up your dining room in a flash.